Infographic: Festivus…for the Rest of Us! There are two mini-decorated trees in the office of 123Print. We had our company holiday party and exchanged cookies. We’ve wished one another “Happy Holidays” and we’re all anxiously awaiting our time off. There’s one holiday that is blatantly being ignored by all employees here at 123Print, and frankly I’m a little bummed about it. How many of you have watched Seinfeld? I hope every single person on the interwebs has watched at least one episode of Seinfeld. If you haven’t… you’re missing out. It’s easily one of the best sitcoms that came out of the ‘90s, but I digress. George Costanza is short, bald, not good with women, and his driving force in life is to do as little as humanly possible. He doesn’t even celebrate Christmas. He celebrates Festivus. George: Nothing. It’s a card from my dad. Elaine: What is it? “Dear son, Happy Festivus?” What is Festivus? Jerry: – his father hated all commercial and religious aspects of Christmas, so he made up his own holiday. Elaine: Ohhhh, and another piece of the puzzle falls into place. Jerry: And instead of a tree, didn’t your father put up an aluminum pole? George: Alright, Jerry, stop it! Jerry: And weren’t there always Feats of Strength that always ended up with you crying? Festivus is celebrated on December 23rd and a way for the public to celebrate the season without getting all wrapped up and participating in its blatant commercialism. The two major parts of Festivus (aside from the unadorned aluminum Festivus Pole) are the Airing of Grievances and the Feats of Strength. To make a long story short, the Airing of Grievances happens right after the Festivus dinner, and it’s the time for people to lash out at others (and the world) about how much they’ve been disappointed in the past year. 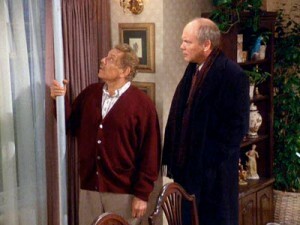 Frank Costanza: The tradition of Festivus begins with the Airing of Grievances. I got a lot of problems with you people! Feats of Strength is the final Festivus tradition. This timeless tradition is where the head of the household challenges one Festivus guest to a wrestling match. The Feats of Strength is not completed until the head of the household is pinned within said wrestling match. Still a little confused? Need some visuals to help ease your way into celebrating Festivus with your loved ones this year? Not a problem. CableTV’s infographic spells out exactly how you (and yours) can take part in the timeless traditions of Festivus. Here’s to hoping you have a Festivus miracle this year!